Not so wordless…….My theory on who I think this may be. He has such a penetrating gaze. At the bottom on the photo I seem to be able to make out the top of Sperl and possibly the word Christof. My theory is that this is the great great grandfather of my husband. Christof Sperl was born in Rosshaupt, Bohemia in 1832 and emigrated to the USA in 1869. He settled in Millvale PA, which is a suburb on Pittsburgh and it lies on the banks of the Allegheny River. There were quite a few settled from Bohemia to settled in Millvale. He died in 1902 and is buried in St Anthony’s Cemetery. The cemetery has no records of where he is buried but the death record listed it as his place of burial. GOOGLE TRANSLATE is my favorite translating site. It will translate web sites, but not the content of old documents you may find. So far I have used it for German, Czech and French. A lot of Genealogy groups have website in their native language and I find it easy to view the contents after their translation. I use it all the time and am well pleased with the results. "The blush on my conformation Easter 1915. ", according to Google Translate. I do not know what is meant by The Blush. My grandmother is in the second row from the bottom on the far right. I like the collar on the ministers robe. Anna was born in 1900 so her age was 15 at the times. Taken in Celle Germany. At least for the time being. I am exhausted, mentally that is, in looking for Robert Stephens and Jacob, Mary and Olive Bowser in the 1880 census in Allegheny City PA. I did not find Jacob and Mary Bowser in the 1870 census except for a couple living in BUFFALO TOWNSHIP I see it is now North Buffalo Township, what happened to the regular Buffalo Township. The couple at the time of the census were Jacob and Mary both were 59. But the youngest son, Jacob was 6. Olive would have been born in 1874 and at that rate Mary would have been 63. I seriously do not think this is MY Jacob and Mary. But there is a will to see and I need to see if Olive is listed in the will. This Jacob died in 1878, Olive would have been four. I am wondering if the Stephens family and Bowser family live on the same street in Allegheny City and the census was skipped or not read?? At this point anything idea is possible. I did update my family tree and changed the name of my Great Great Grandfather from Thomas Dowd to John Dowd and his wife from Cate Sweeney to Catherine Fitzmorris. Two things lead me to believe it was true. The first was the information given by Bridget Naughton Dowd at the time of her husbands death. She had stated that her husbands parents were John Doud and Catherine Fitzmorris. Secondly in searching the records from Glinsk Parish in Galway I found John, Catherine, Thomas, John, Maria and the two women and My Theory that they were Thomas’s sisters (Catherine DOWD Mulroy and Norah DOWD Finnerty). That theory proved correctly with the parish records. Thirdly was the inclusion of Fitzmorris relatives for the sponsors on a few of the Dowd Children Baptism, my grandfather was one of them. I have to take a break and consider what to do next. On my trip to Armstrong County, a helpful man looked up the records of the 155th Infantry Company I and it listed my relative, Robert Stevens (Stephens) as discharged in 1862, invalid. I have to look how to get a copy of his discharge papers, perhaps that will be helpful to me. Olive seems to be the most elusive of all the ancestors. Following yesterdays excursion to Kittanning, I revisited the documents that I had in my collection. On the naturalization record of her second husband, Oswald Rohut, it states the place of her birth is the NS Pittsburgh. That would be the North Side of Pittsburgh. Up until 1907, the North Side was Allegheny City. It was a town unto it own. In that year ALLEGHENY CITY was forcibly annexed to the City of PITTSBURGH. From the reading it does not appear that this was a welcome merger in the City of Allegheny. I have searched for both Robert Stephens and the family including Jacob Bowser/Bauser, his wife Mary and my ancestor Olive Bowser. In the 1900 and 1910 census it lists Olives parents and Olive as born in Pennsylvania. I can not find either of them in the 1880 census. I have tried to read the entire census report and still no luck. In 1880 Olive would have been five or six years old and Robert would have been twenty five. An interesting note which was told to me on Thursday was that a lot of young women would marry the old Civil War Veterans in order to be eligible for their Civil War Pensions. At least for now, that is.......First, I got lost in the town of Kittanning PA. It is not exactly that big, somehow I passed up the entrance and had to call the place and a kind lady helped me get to the right place. The Olive Bower listed with Mary as her mother was not correct. The first Olive died in 1885 so she was quickly eliminated. Next, and a lot of help, I found a Jacob and Mary Bowser in the 1870 census, but no Olive. Then I found Jacob died in 1878, so that was why I could not find him in the 1880 census. But Mary was 52 at the time of the birth, so I have my doubts about this family. My next stop will be to go to the Armstrong County Courthouse and see the will of the above Jacob Bowser. I will save that for another day. Since my recent discovery involving Olive Bowser, her mother Mary and exactly who is her father....I am going to the Armstrong County, PA town of Kittanning tomorrow. The Armstrong County Genealogy Society has hours Tuesday, Wednesday and Thursday from 12 until 4. If a person wants to use the library the cost is $4.50 per visit. Hopefully, I can find information that will show the relationship of Great grandmother Olive Bowser and her parents. I have found some preliminary information I think might be a solid lead. I am hoping the folks there might be able to guide me. The interesting thing about this Society is that they are closed from November thru the end of February. I find that a bit odd. Why do they do that? If I find out I will have to post the reasoning behind the idea. Fact is Olive Bowser born C. 1874 with mother named Mary, the only place I have found them is in Armstrong County. I have to solve the name of the father, who on the census is listed as Felix and on the Civil War register a person of that age and living in Franklin Township is Jacob F. Bowser. My theory and gut feeling is that is Jacob Felix. I hope this will be answered. And on an earlier census Levi is listed as Felix father, and the mother is another Mary. Seems Felix has a multitude of siblings, as did very one else at that time. Also listed are Van Buran, Absolam, Felix, Harrison, Hannah and Wilson. I must admit they were pretty creative with their names. This is my great grandmother Maria Anna Johanna Korbach Bartels. From the picture of her as a young woman it says it was taken in Jena, Germany. I know virtually nothing about her or her family. The second picture is of her gravestone. It says Maria Bartels geb Korbach. I can not read the dates, and I wonder exactly where it is located. Is the person in front of her my great grandfather? I tried to enlarge the picture but it was a Polaroid photo, I think perhaps my grandmother, Anna Bartels Schridde took it or one of her relatives to send to Anna. I remember she was alive during my life time. I am thinking that perhaps she died in the late 1950’s or early 1960’s. At last Saturdays meeting, John Colletta talked about using many sources to identify your people. Or what you think could possibly be your people. I am back to the Bowser/Bauser side of the family. 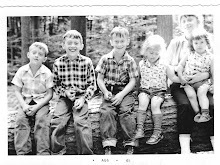 I had searched a few months to find grand mother Mary Stephens Sperl parents. First I found Robert Stephens, her father. I found him by visiting UNION DALE CEMETERY because Chuck said his father went there to decorate "A civil War Soldiers Grave” That Civil War Soldier proved to be Chucks great grandfather and Mary's father. This led me to the 1900 Allegheny City census and I found Robert and the children along with his wife Olive. Robert was 25 years older than Olive. After brain storming and help from Aunt Edna, who is 85, I found her buried in Salem OH. She had remarried, her name is now Olive Rauhut. On Olives death certificate it listed her father as “Jacob” I have had a futile search for Jacob and Olive Bowser. Until listening to John Colletta lecture. Back to re-read my papers, I know I should have done that. What I missed was Olives mothers name which was Mary….. He said to search under siblings etc. My etc proved to be mother Mary and Olive and I have a viable candidate in Kittanning in Armstrong County PA. Which is up the Allegheny River from the city of Pittsburgh, where Robert and Olive lived. Olive was born in 1874 and in the 1880 census they are living with the father Felix and quite a few children. Off to check the Civil War records and what do I find but an enlistment in the 139th Regiment Pennsylvania Infantry, and listed is Jacob F Bowser and this regiment has enlistees from Kittanning and Pittsburgh. My theory is this is a likely candidate for my Jacob Bowser. I have contacted the Armstrong Genealogical Society and a short trip is due to search through those records, Good thing is it is only a 30 minute drive. What amazes me is that ALL of the people I search for in the USA are in Western PA. They never moved far. Willie Schridde, 39, Meets Death In Home Near Kennywood Park As Bolt Streaks Down Chimney. A freak electrical storm, accompanied by a heavy downpour of rain, struck the district early today, Lightning Killed a Mifflin Township man, but did small damage to house and other structures. Willie Schridde, 39 of 339 Vista View Street, Mifflin Township, near Kennywood Par, a German Veteran of the World War, was killed shortly before 6 a. m. today when struck by lightening which came down the chimney of his home. His wife Anna, 36, and daughter Gerda, 13, who were unharmed by the bold which killed the father, ran to the second floor of their bungalow home to find Schridde’s clothing afire. The wife extinguished the blaze and called Dr R L Botkin, of 27 South Second Street, Duquesne, who pronounced Mr. Schridde dead. Mr. Schridde was a millwright at the Duquesne Works of the Carnegie Illinois Steel Corporation was remodeling into a two story dwelling the little home which he built by himself three years earlier. Schridde came to this country ten years ago after serving in the German Army during the war. His wife said he had undergone 17 operations for wounds received in the war but was in good health in recent years. He had risen early today to shut the windows in the attic when he was killed while walking past a fireplace, his wife said. In the course of two days Emily has received calls for interviews. All I can say is it is a good thing she has a Subaru……..
More on them after the fact……..Her Karma is good this week……….. This is one of the other side of the stone that was featured last Tuesday. This is the father of the children Johann Sperl, Anton F Sperl, and Margaretha Sperl. Anton was born in Rosshaupt, Bohemia according to the records of the Diocese of Pittsburgh. He died from Typhoid Fever a few weeks after grandfather John C Sperl Was born in 1899. It was great, John P Colletta is extremely knowledgeable and he can weave a story. The information he presented was extremely helpful for me because being relatively new in researching. The searching he suggested made a lot of sense and somehow I wondered why did I not do this kind of search routinely? Another treat was the lunch. We had pasta and lettuce salad, chicken, ham, green beans, carrots and roasted red skinned potatoes and pie for dessert. Has written a recent book, ONLY A FEW BONES which he spoke of how it took years to research and all the documents he need to write the story. I would have purchased it but it was sold out. I will go back to next years meeting. I am relatively new to Genealogy meetings. I have attended two local meetings. One was on German research and writing given by JOHN HUMPHREY It was a two day course on German research and handwriting. This was sponsored by the WESTERN PENNSYLVANIA GENEALOGICAL SOCIETY It gave me a lot of information and the handwriting section on the old German Scripts was excellent. Tomorrow the meeting is featuring JOHN P COLLETTA PHD. This is an all day conference hosted by Tarentum Genealogical Society and in association with the Armstrong County Historical Society and the Oakmont Genealogical Study Group. The four topics are Passenger Arrival Records, How to Prepare for Successful Research in European Records, Breaking Through Those Brick Walls, and Discovering Your Ancestors’ World thru Maps and Gazetteers. I am really looking forward to this education meeting; it is an all day affair and only twenty minutes from my home. Perhaps after I retire I can attend the weekly meeting that I read about and a lot of Bloggers attend.